Innocent enough? Swimming from or near a boat dock that has electricity installed can have tragic consequences, says Boat Owners Association of The United States. ALEXANDRIA, Va., July 17, 2013 - Last year over Fourth of July weekend, Alexandra Anderson, 13, and her brother, Brayden Anderson, eight, were swimming near a homeowner's dock on the Lake of the Ozarks in Missouri when they started to scream. By the time the siblings were pulled from the lake, they were unresponsive and a short while later were pronounced dead. Two hours later on Cherokee Lake in Tennessee, 10-year-old Noah Winstead, died in a similar manner, while Noah's friend, 11-year-old Nate Parker Lynam, passed away the following evening. These were not drowning victims. In all four of these cases, 120-volt AC (alternating current) leakage from nearby boats or docks electrocuted or incapacitated swimmers in freshwater. This little-known and often-unidentified killer is called Electric Shock Drowning or ESD. "Every one of these deaths was preventable," said Boat Owners Association of The United States (BoatUS) Director of Technical Services Beth Leonard. "Any boater and every adult who swims in a freshwater lake needs to understand how ESD happens, how to stop it from happening, and what to do - and not to do - if they ever have to help a victim." To help them with this vital task, BoatUS has put together a new online Electric Shock Drowning Resource Center to educate and inform the public about ESD at BoatUS.com/seaworthy/ESD.asp, and offers helpful tips below. "An effort to increase safety standards on marina docks has been underway for several years now, but few resources have been available for the general public," said Leonard. "ESD is a complicated subject, and what information has been available for boaters, private dock owners, and swimmers has, all too often, been inaccurate, incomplete, or misleading. Our Electric Shock Drowning Resource Center addresses this problem with a range of helpful articles and presentations, all of which have been vetted for technical accuracy. We'll continue to add to and update this material to ensure it remains a valuable source of information," she added. 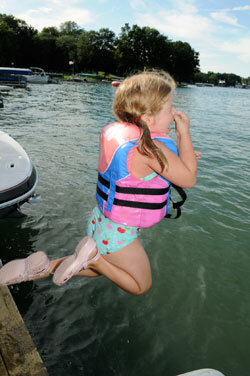 So what should boat owners, private dock owners, and swimmers do to prevent ESD? A diagram of how Electric Shock Drowning occurs. Tell others about ESD. Most people have never heard of it and are unaware of the danger. To retrieve a person in the water, reach, throw, and row - but don't go. Make sure your children understand the importance of not swimming anywhere there could be electricity. Don't let them roughhouse on docks. Tell them what to do if they feel a tingling or shock in the water (see below). ESD victims are good candidates for successful Cardiopulmonary Resuscitation (CPR). Learn to perform CPR and maintain your training. NEVER swim within 100 yards of any freshwater marina or boatyard. Talk to marina owners or operators about the danger of ESD. Ask your marina operator to prohibit swimming at their facility and post signs. Ask marina operators if they are aware of and follow the guidelines in National Fire Protection Association (NFPA) 303 (fire protection standard for marinas and boatyards) and National Electric Code (NEC) 555. Have your boat tested once a year to see if it is leaking electricity, or buy a clamp meter and test it yourself. If you find any problems, have your boat inspected by a qualified electrician trained to American Boat and Yacht Council (ABYC) standards. Have a qualified ABYC electrician install an Equipment Leakage Circuit Interrupter (ELCI) on your boat (refer them to the ABYC E-11 Standard) or use a Ground Fault Circuit Interrupter (GFCI) in the shore power cord. As an alternative, install an isolation transformer on the boat. Test the GFCI/ELCI at least once a month or per the manufacturer's specifications. Do NOT do your own 120-volt AC electrical work on a boat or hire an electrician who is not familiar with ABYC standards to do it. Many of the problems that lead to an electrical fault on the boat result from the differences between shore and boat electrical systems and standards. DO NOT use common household extension cords for providing shore power to your boat. Use, and encourage other boaters to use, shore power cords built to UL standards, ideally with a GFCI built in. NEVER dive on your boat to work on underwater fittings when it is plugged in to shore power, even in saltwater. NEVER swim within 100 yards of ANY dock using electrical power! If you have not electrified your dock or put an AC system on your boat, weigh the risks carefully before doing so. If you need electricity on your dock, hire a licensed electrician and make sure the wiring meets the requirements in NFPA 303 and NEC 555. If your dock is already wired, hire an electrician to check that it was done properly. Because docks are exposed to the elements, their electrical systems should be inspected at least once a year. Exercise your GFCIs/ELCIs as recommended by the manufacturer. If you normally run a power cord from your house or garage to charge your batteries, make sure the outlet has a GFCI and include a GFCI somewhere in the shore power cord. NEVER swim off your dock without shutting down all shore power to the boat and the dock. Even if you adhere to all of these rules, nearby docks can still present a shock hazard. Educate your neighbors and work together with them to make the waterfront safe. DO NOT follow your instinct to swim toward the dock! SHOUT! When electricity is not involved, drowning victims cannot speak, let alone shout. Tell those around you exactly what you're feeling so they can help you while keeping themselves safe. Try to stay upright and back out of the area the way you came, warn any other swimmers in the area of the danger, and then head for shore 100 yards or more from the dock. Alert the dock or marina owner and tell them to shut the power off to the dock until they locate the problem and correct it. Go to the hospital, explain what happened, and ask to be checked over to be sure there are no adverse health effects. Know how to distinguish drowning from ESD (drowning victims cannot speak and look as if they are trying to climb a ladder; screaming, shouting and tingling, numbness, or pain indicate ESD). Fight the instinct to enter the water - many rescuers have died trying to help ESD victims. Call for help. Use 911 or VHF Channel 16 as appropriate. Turn off the shore power connection at the meter base and/or unplug shore power cords. Get the victim out of the water. Remember to reach, throw, row - but don't go. If the person is not breathing or you cannot get a pulse, perform CPR until the Fire Department, Coast Guard, or ambulance arrives.